Teens love Atomy Skin Care! Watch from 16:27 and 16:52. She's using Atomy! Wash your face and your hands. Dispense a small amount of BB cream onto the back of your hand. Dot small amounts of the BB cream onto the major areas of your face (nose, chin, cheeks, forehead). Gently pat the applied cream around your face. Gently smooth out the application with your fingers. Using the BB cream as your foundation or primer, apply any makeup if you desire. A little product goes a long way and using too much in one area will make you look like a ghost. If your skin tone matches the cream, you may not even need a foundation. Men also use BB creams too for that blemish-free look. If you’re using Atomy’s Morning Care 6 set, apply the BB Cream after all 5 other products have been applied and use only a small amount. Your skin will look healthy and smooth. 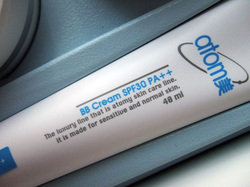 Note: Atomy updated the packaging of its BB cream in 2014. First: Use the Deep Cleansing tube and apply small amounts to your forehead, left and right cheeks, and chin. Gently massage over face for 1 minute then use a tissue to wipe away or cleanse your face with water. Second: Wet your hands and dispense a pea-sized amount of Foam Cleansing into your hand. Lather product in hands then gently massage over entire face. Rinse your face with water then pat dry with a towel. Do this 1-2 times per week or as necessary: Peeling Gel: Dispense a small amount of Peeling Gel onto the back of your hand then apply to your forehead, left and right cheeks, and chin. Gently massage all over face then wait 2 minutes for product to dry out a little. Massage the product until it begins to bead then rinse face with water. Pat dry with towel. Peel-off Pack: Dispense a proper amount of the Peel-off Pack onto the tips of your fingers and lightly cover the entirety of your face, avoiding eye areas. Wait 20 minutes then peel off the dried mask. Do not rush this step as the product is very sticky and difficult to wash away when wet. Finish by splashing cold water over face to close pores and pat dry with a towel. "I wear this every day in one form or another, mainly because I’m afraid my skin will start breaking out if I used anything else. Since being introduced to this line months ago, I’ve switched everything on my vanity to Atomy. There isn’t one product that I use that is not from this company, from toothpaste to daily skincare products. If I didn’t like any of it, I would have stopped using it a long, long time ago, which is the reason why my Isa Knox skincare products have been sitting in my room for almost a year now without even being touched. With ingredients like Green Tea, Vitamin E, and Herbs, this BB Cream is one of the best I’ve used. More than anything, I feel safe knowing that it’s made with natural ingredients. It came with a 6-piece Atomy daily skincare set, which I’m absolutely crazy about. I had never used an entire set before (Koreans have this multiple skincare routine starting with a toner, usually ending with a nutrient cream) because they would never fail to break me out. It was different this time however, though it did take about a month for my skin to fully adjust to the products. All my dry spots have disappeared and my skin just looks healthy and clearer in general. I have a sensitive skin which used to turn red on the cheeks with dry spots in random places that would never go away. My endless search of skincare products has come to an end, and with huge savings (it’s much cheaper than what’s sold in stores, BB cream is only $20 compared to others that cost at least $30)! What makes it unique is that they are not sold in stores. As I noted in previous post, while the initial products were sent to me by a relative in Korea to try out, I purchased extra ones to be shared with those in a similar situation as I was, looking for affordable skincare products made with natural ingredients that actually work without damaging skin. The company is run by a membership only system so you can either choose to purchase from a member or become a member yourself and enjoy even deeper discounts on the products. So yes, I became a member soon after realizing the quality of the products since there is no associated fee or strings attached. It’s just awesome to have an easy access to top quality Korean products which I had desired for a long time. While the coverage obviously isn’t as good as foundation (because it isn’t foundation after all; they are two very different products) but considering all the skincare benefits it offers (sunscreen, whitening, etc) it really is a much better choice for your skin, hands down. I stopped using foundation a while ago (I was using both BB cream and foundation when I wrote above post) and started only using Atomy BB Cream, then Makeup Forever multi-color concealer to cover my blemishes (both redness and spots) and a pressed powder to set it. That’s pretty much my weekend makeup routine (I only do sun cream and BB cream during the week)."